I am closing in on the home stretch with baby #7. Lately I have not been sleeping well at all. I just am struggling to get comfortable. 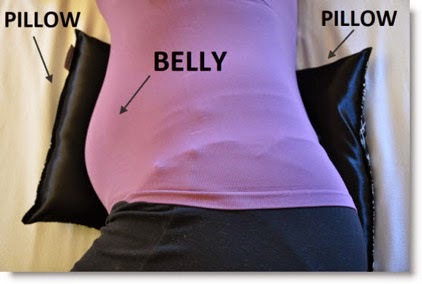 I have tried wedging a pillow under my ever growing stomach, and it just feels worse.. kind of like a pillow that is too large, wedged under a too large belly. When I first saw it, I thought it would be too small. It isn't at all. It really contours to my belly, giving me the support where I need it, rather than stretching from top to bottom of my abdomen. It is extremely comfortable. The smaller size is actually one of it's best features. So easy to relocate in the night if I need to, and easy to transport to the couch if I decide to take a little snooze there. I so wish I would have found this earlier in my pregnancy! 8.5 by 12 inches in size, the pillow had to cushions with a flat surface in the middle for your back. I love how there is not only a pillow on the front, but one to lean against on the back as well. Small! Most pregnancy pillows are huge and seem to take up half of the bed. 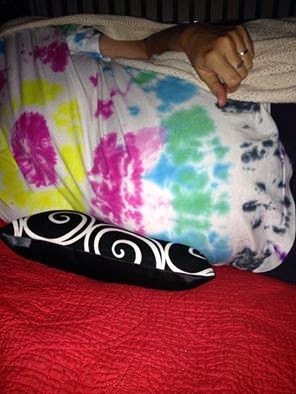 In contrast, the compact Belly Rest Pregnancy Pillow allows you to sleep comfortably while still in the same zip code as your dear spouse. In addition to being good for your marriage, it's also great for travel. At under a pound, the Belly Rest provides you with the ultimate in discreet portability. Comfortable! During development of the Belly Rest, fourteen different prototypes were tested on nine different pregnant women (humanely, mind you - no pregnant women were harmed in the development of the Belly Rest). The result of this painstaking process was a pillow that has routinely been called a "lifesaver" by pregnant women across the world. Convenient! Washing your pregnancy pillow shouldn't be like taking a sleeping bag to the Laundromat - and with the Belly Rest, it isn't. Just throw it in your washing machine along with like colors and tumble dry low. No slipcover to mess with, no roll of quarters required. This is a MUST for all pregnant mamas! It really has helped my nights to go much easier, and I am able to get the long needed rest that I haven't had for awhile. Simple design, yet brilliant! I do wish I had this when I was pregnant. I think this would make a great gift for expecting moms. It looks wonderful to have.